OVERVIEW: One Team. One Country. The universal language of sports has never spoken so thrillingly as in Clint Eastwood’s Invictus. See how the story unfolds when Invictus arrives on Blu-ray Combo Pack and DVD this May 18 from Warner Home Video. From acclaimed director, Clint Eastwood, Invictus tells the inspiring true story of a leader trying to rally his divided nation around an underdog sports team. On May 18th Invictus will also be available ON DEMAND through Digital Cable, Satellite TV, Xbox 360 and PlayStation 3 game consoles and it can be downloaded for rental or purchase on iTunes and Amazon Video On Demand. The Killer Cut will be available exclusively for purchase on iTunes, PlayStation 3 game consoles and Amazon. SYNOPSIS: What does Nelson Mandela do after becoming president of South Africa? He rejects revenge, forgives oppressors who jailed him 27 years for his fight against apartheid and finds hope of national unity in an unlikely place: the rugby field. Clint Eastwood (named 2009’s Best Director by the National Board of Review) directs an uplifting film about a team and a people inspired to greatness. Morgan Freeman (NBR’s Best Actor Award winner and Oscar nominee for this role) is Mandela, who asks the national rugby team captain (Best Supporting Actor Oscar nominee Matt Damon) and his squad to do the impossible and win the World Cup. Prepare to be moved – and thrilled. 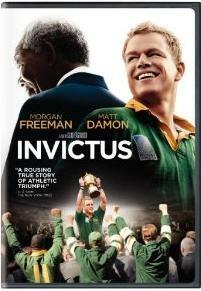 DVD: Invictus is presented in a widescreen format preserving its theatrical released format. The picture is complemented with a 5.1 Dolby Digital audio in English, Spanish and Francais. In terms of special features the DVD includes a six minutes documentary about Matt Damon's rugby training, also it includes the Invictus music trailer. Matt Damon Plays Rugby (6:48) - Turning a Hollywood star into a rugby player.